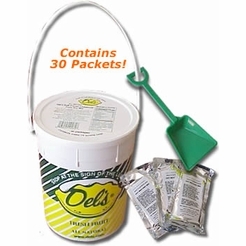 If you truly love Del’s Frozen Lemonade than this is a must have for the summer! 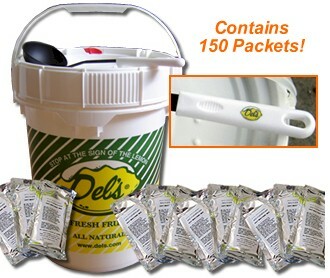 There are 150 packets included and each of those will make 16 ounces of refreshingly delicious Del’s Frozen Lemonade. 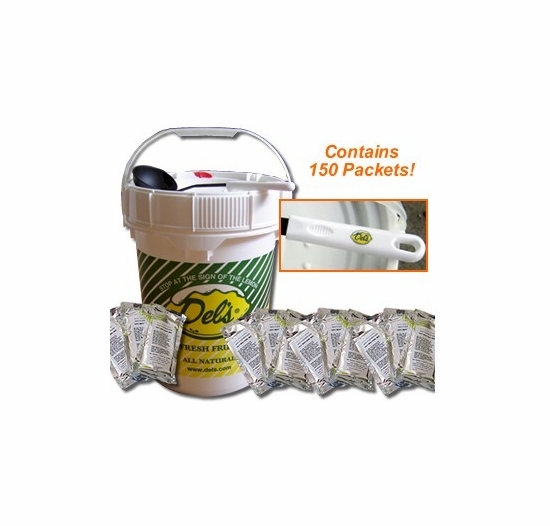 Forty packets will make up to 5 gallons! Feel free to make a few packets at a time or if you are making all the packets in one sitting than you will have a total of 18.75 gallons! Blend as much or as little as you’d like and ladle it out of the Del’s container for a nostalgic affect. 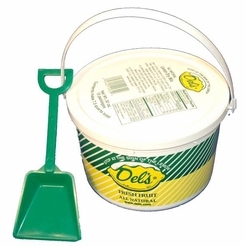 Please Note: All Del's 5 Gallon Buckets are shipped Standard UPS Ground only in the continental United States. For shipping to Alaska or Hawaii, please contact us for exact shipping amount. Please allow 2-3 business days for this product to be shipped. Ingredients: Filtered Water, High Fructose Corn Syrup, Sugar, Lemon Juice Concentrate, Citric Acid, Lemon Oil. This item is not available for 3-Day, 2-Day, or Next Day Shipping.